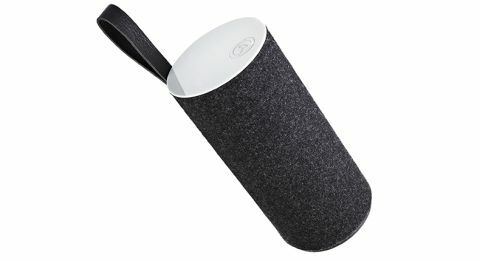 Libratone Zipp review | What Hi-Fi? Libratone is a relatively new company, and this is the third speaker that we’ve seen from it. While both the Beat and the Live were qualified successes, they couldn’t quite justify their premium price tags with their sound quality. The Zipp aims to change that. As with its predecessors, it’s an upright design and claims to deliver a 360-degree sound as a result. It has a fairly premium feel, though the plastic top is a bit, well, plasticky. The most obvious style point is the zip-up sleeve, hence the name. You get a choice of coloured felt covers, too. The ‘classic collection’ has black, blue and red zip covers, while the ‘funky collection’ are altogether brighter purple and yellow offerings, as well as black. An AirPlay speaker, the Zipp also has Wi-Fi Direct functionality, which means you don’t need a wireless network to stream music from your portable: your device and the speaker can form their own network. Libratone calls its take on the feature 'PlayDirect'. Whatever the name, it’s a handy feature for when you’re out of range of your internet connection – out in the garden, say. The rechargeable battery comes in handy here, too, though it’s good for only around four hours’ streaming. It’s the sound quality, however, that really steals the show. Open and clear in the treble, the Libratone Zipp instantly makes us sit up and take notice. There’s no harshness to treble notes, there’s no boominess to bass – it’s easy to listen to with all sorts of tunes. The sound character is fast, tight and punchy rather than particularly weighty, so don’t expect lashings of bass, but the trade-off is a subtlety and level of detail that stands out in this crowd. Libratone has finally nailed it with the Zipp. It’s not too expensive, it boasts plenty of features and a nice little USP – but it’s the super sound quality that seals the deal.